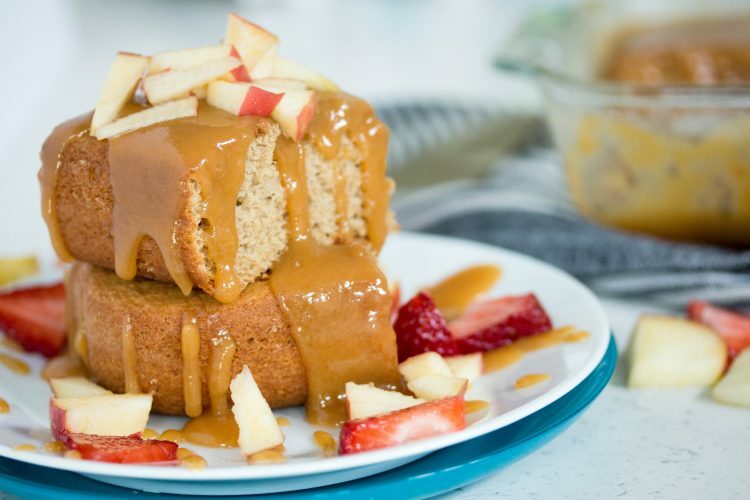 Gooey, buttery caramel and perfectly spiced apple cake just belong together! If you’re going to indulge on something NOT healthy, this would be my recommendation. Holidays bring a renewed sense of what’s most important. We allow life to slow down slightly which opens up more time for family and friends. Obviously, food is a huge part of my life especially during holidays. I could spend all day everyday in the kitchen since I love cooking and creating SO I’ve learned how to include my kids. Most the time, I sincerely enjoy baking with my two young kids. My daughter (6) and son (3) have become fabulous sous chefs. When you have little helpers like I do, mentally prepare for flour being sprinkled across the floor and spills and messes. Each time I tell myself, ‘it’s not about the end product but the memories created with them. Don’t stress about the mess’. 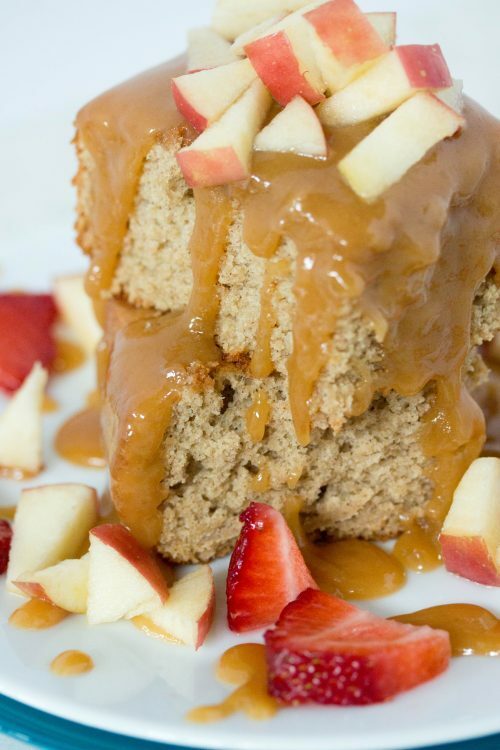 This apple and caramel cake recipe is a perfect recipe for little ones to help with. There are several opportunities to pour and scoop in ingredients. For my 3 year old son, I prepare the ingredient and assist him in adding the ingredient to the recipe. He also loves to turn the standing mixer on and off. My 6 year old can help with the same things, however I give her opportunities to prepare the ingredients like scooping up the baking powder, sifting the flour, pouring applesauce into measuring cup, etc. They love it! They are also great with clean up and feel pretty helpful when asked to put away ingredients or scrub a dish in the sink. AGAIN, it’s not about the end product (like dishes actually getting scrubbed clean or ingredients placed in the perfect spot). It’s about building memories while teaching them to follow instructions, work, and actually enjoy it! Slight confession… I hadn’t used my candy thermometer in over a year since we moved to Texas. I’m a healthy eater, remember? I rarely make these type of recipes and my candy thermometer is not frequently used. WELL, while I was making my caramel, I closely watched my candy thermometer and it was remaining at 190 degrees despite the changes in color and texture of my caramel. It took me a LITTLE longer than it should have to realize my candy thermometer was not working. I cooked my caramel a little long (like I should have poured the caramel into a pan to set for hard caramels), BUT I still poured it over the cake. It was still delectable and the gooey caramel was a perfect topping. The goal, however, is to stop cooking the caramel at the right temperature so the caramel sinks into the cake similar to a tres leches cake. Learn from my mistake and make sure your candy thermometer is calibrated and working correctly. Alright friends! Go. Make. Indulge. 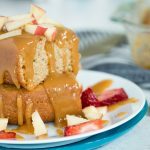 I can’t wait to hear your feedback on this caramel apple cake! 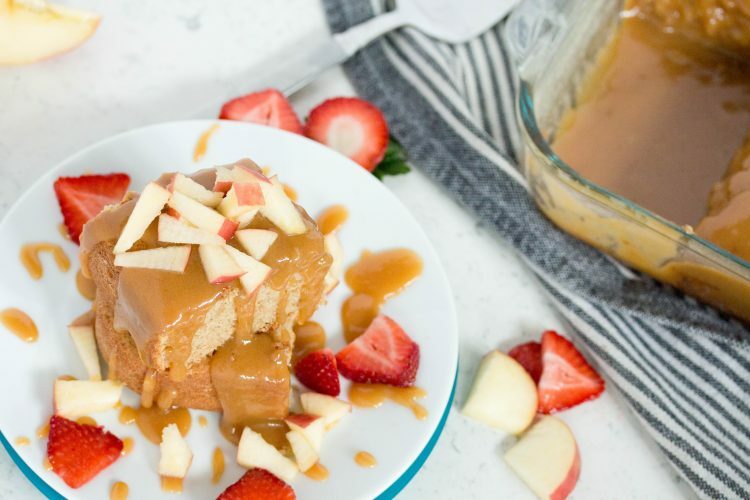 This buttery caramel apple cake will be quickly devoured! Preheat oven to 350 degrees F. Butter and flour bottom and sides of a glass 9x13 baking dish. In a large mixing bowl, combine sifted flour, baking powder, cinnamon, and salt. Whisk together well. In a stand mixer or separate large bowl with a hand mixer, beat egg whites until firm peak forms (6 to 8 minutes). Gradually beat in sugar. Add egg yolks on at a time beating in between each addition. While mixing, slowly add in applesauce. Beat in vanilla. Add flour and milk by alternating between the flour mixture and milk. While beating, begin by adding one-third of flour mixture and one-half of the milk ending with the flour mixture. Make sure each addition is mixed well before adding the next addition. Pour batter into pan. Bake for 20 minutes. Reduce heat to 325 degrees F. Bake for 10 additional minutes. Let cake cool for 15 minutes. Poke holes generously all over the cake with a fork. Meanwhile, in a medium-sized pot over medium heat, combine all caramel ingredients EXCEPT the vanilla. While constantly stirring, monitor the heat of the mixture with a candy thermometer until it reaches 215 degrees F. This should take about 30 minutes. Remove from heat and stir in vanilla. Slowly drizzle half of the caramel over the cake allowing the caramel to soak in for a few minutes. Drizzle remaining caramel evenly over the top. Serve cake warm or allow to fully cool prior to serving. Enjoy!